A zookeeper at the Dallas Zoo was treated in the hospital after being scratched and bitten by a female lion. In a press release, the zoo said it happened Saturday as the lions were transferred in the off-exhibit lion house. “One of the keepers inadvertently left a door open,” said Dallas Zoo President and CEO Gregg Hudson. The lioness bit and scratched the 35-year-old male zookeeper, who used pepper spray to get away. “Our initial look at this incident is that it was human error that left a shift door inadvertently open,” Hudson said. Additional keepers responded. The lion was sedated and moved to a secure area. The zookeeper who was bitten was transported to a hospital where he was treated for non life-threatening injuries. His name is not being released. The zoo said the lion will not be punished or euthanized. The big cat's name is also not being released. The lion habitat in the Giants of the Savanna exhibit at The Dallas Zoo will be open as usual on Sunday. None of the lions in the August 23, 2014 bite were involved in an incident in November of 2013. 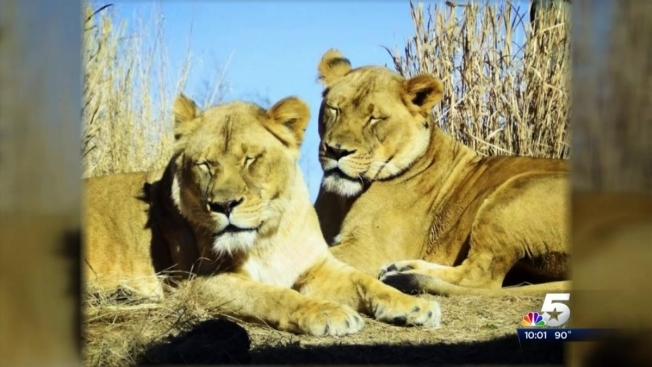 Two male lions attacked and killed Johari the lioness in front of crowds at The Dallas Zoo. The male lions were then separated from the lionesses.